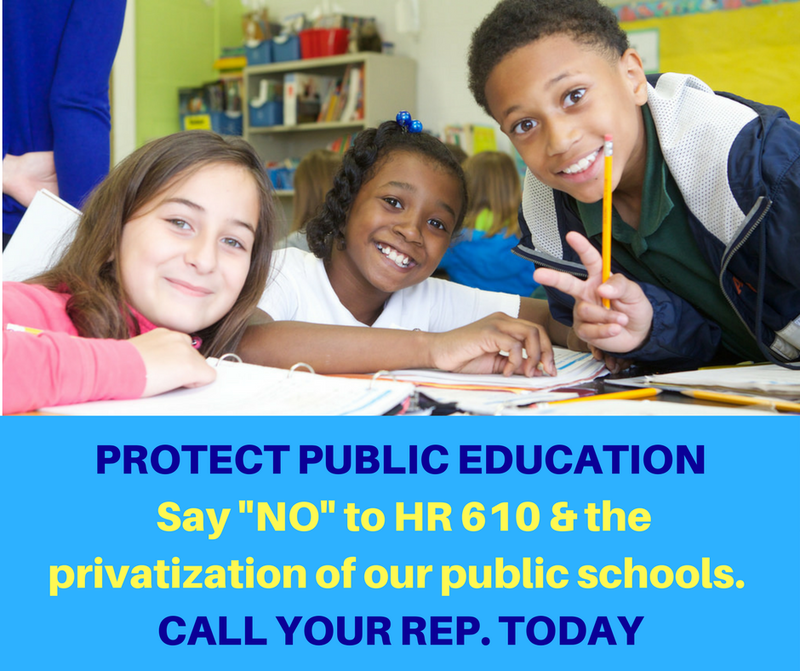 Today's action is simple and important - call your House Rep. and urge him or her to reject HR 610 a new bill that would begin the privatization of our public education system. There's more detailed info about the bill below if you want it. 1. Find your Rep's number(s) here (and add them all to your activism cheat sheet or create a contact in your phone if you haven't already). 3. When you get through, say: "Hi, my name is NAME. I'm a constituent calling from TOWN/CITY. I'm calling to urge Rep. NAME to protect our public education system by rejecting HR 610 that would begin the privatization of our schools. Public education is one of the cornerstones of our democracy and I hope Rep. NAME will be an outspoken champion for it." *If your Rep is one of the few co-sponsors, please say: "Hi, my name is NAME. I'm a constituent calling from TOWN/CITY. I'm calling to tell Rep. NAME that I am extremely disappointed that HE/SHE has co-sponsored HR 610 to privatize our public education system. Public education is one of the cornerstones of our democracy and HIS/HER decision to support the de-funding of our schools is both dangerous and unpatriotic. I urge HIM/HER to reconsider and withdraw support for this bill. 4. Share this action with anyone you know who will join you in calling to protect public education. 5. If you want to contact your Rep. via printed letter (or postcard), website contact form, Facebook and Twitter, that will be helpful, too. The bill would eliminate the Elementary and Education Act of 1965, which is the nation's educational law and provides equal opportunity in education. It would effectively start the school voucher system to be used by children ages 5-17, and starts the de-funding process of public schools. It would abolish the Nutritional Act of 2012 (No Hungry Kids Act) which provides nutritional standards in school breakfast and lunch. It would repeal ESSA (Every Students Succeeds Act) of 2015. ESSA is a big comprehensive program that covers programs for struggling learners, AP classes, ESL classes, classes for minorities such as Native Americans, Rural Education, Education for the Homeless, School Safety (Gun-Free schools), Monitoring and Compliance and Federal Accountability Programs. Includes provisions that require school districts to use research-based instruction and curriculum in schools, especially with students who represent groups that have been consistently “underperforming" or underachieving. ESSA also requires that states write Title I (ESSA granted federal funds to assist students and schools in poverty) plans to address how they will improve conditions for learning including: reducing incidents of bullying and harassment in schools, reducing overuse of punitive discipline practices and reducing the use of aversive behavioral interventions (such as restraints and seclusion). All of this goes away if ESSA does.